Electric car-maker Tesla has been admonished by the US watchdog investigating a recent fatal crash involving one of its cars. The National Transportation Safety Board said it was “unhappy” the firm had made public details of the probe. The company had blogged on Friday that the Model X car involved’s Autopilot self-steering system was in use at the time of the accident. Walter Huang, an Apple engineer, died after his car hit a barrier. 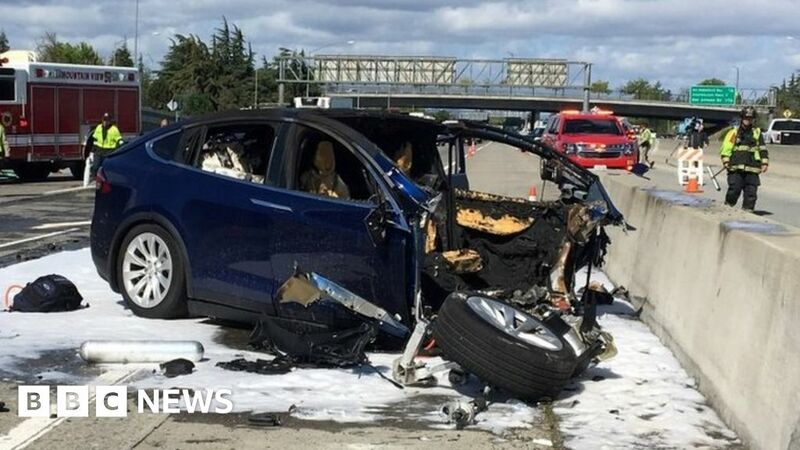 Tesla had also revealed that logs from the vehicle’s computer had indicated that the 38-year-old’s hands were not on the steering wheel in the six seconds prior to the collision on California’s Route 101. It said the car had provided several “hands-on” warnings earlier in the journey. In addition, it said that the safety barrier involved had been crushed and not replaced after an earlier accident, meaning it would not have been able to reduce the force of the impact as intended. “At this time the NTSB needs the assistance of Tesla to decode the data the vehicle recorded,” responded the agency’s spokesman Chris O’Neil in a statement first published by the Washington Post. “In each of our investigations involving a Tesla vehicle, Tesla has been extremely co-operative on assisting with the vehicle data. It is unusual for the agency to announce its displeasure in this manner. The Bloomberg news agency noted that the organisation had previously expelled airlines and aircraft-makers from other investigations in which unauthorised statements had been given. Several news reports had speculated that Tesla’s Autopilot technology had been active at the time of the 23 March crash. And it is likely the firm made its announcement to avoid the detail leaking out and being confirmed without further context. There had already been a report by ABC News that Mr Huang had made complaints about the performance of his car’s Autopilot facility prior to the accident. But Tesla has downplayed the claim. “We’ve been doing a thorough search of our service records and we cannot find anything suggesting that the customer ever complained to Tesla about the performance of Autopilot,” a spokeswoman told the BBC. Tesla’s semi-autonomous driving technology had been involved in an earlier fatality when a Model S car collided with a lorry in 2016. The death of a woman in Arizona, who was hit by one of Uber’s self-drive test vehicles in March, had also recently raised fresh concerns about the use of automated car tech on public roads. In a related development, it has emerged that Tesla has changed the way that Autopilot is controlled on its Model 3 cars. Until now, the function could be switched on and off via a steering wheel button, but other adjustments required the driver to use a touchscreen, which might distract them from the road. News site Engadget reports that its settings can now be changed via the steering wheel’s scroll buttons. You Dumped Facebook. So Why Does It Keep Sending You Emails?